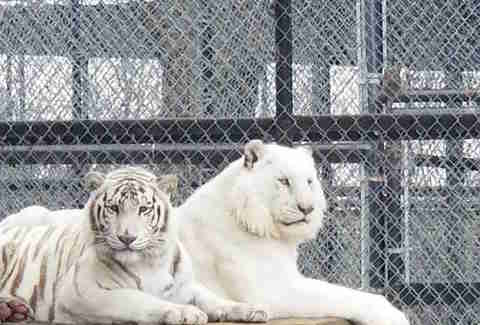 Trapped in a barren enclosure on a private property in Texas, the future looked grim for a pair of white tigers, sister and brother, named Zahra and Assad. Two months pregnant, Zahra should have been preparing for her new cub by building a secluded den where she could give birth comfortably, protected from bad weather. But she had nowhere to hide inside the cage where she and Assad, the cub’s father, lived. Isolated and without proper care or medical attention, her cub would most likely not make it. 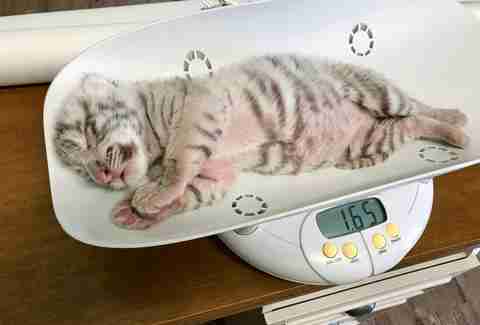 But the expectant tiger parents’ luck was about to change. 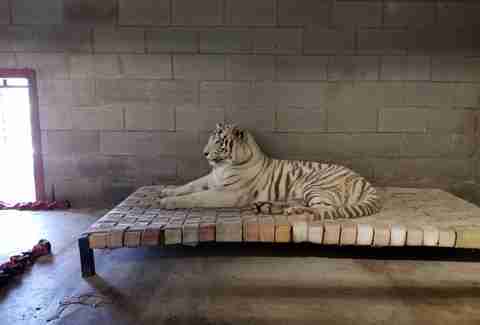 On January 18, rescuers with Texas Parks and Wildlife and a local county sheriff's office saved Zahra and Assad when officials discovered that the tigers' owner did not have the proper paperwork to house them legally. (The exact location where the tigers were held was not officially released to the public.) 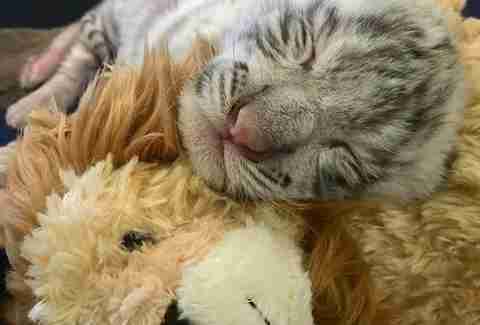 The two tigers were rushed to In-Sync Exotics, an animal sanctuary that cares for neglected, abused and unwanted exotic felines in Wylie, Texas, where, against all odds, they were given a clean bill of health. On March 6, 47 days after the rescue, Zahra gave birth to a healthy male cub in the safety of the sanctuary. The miracle baby was named Kylo Ren, in a nod to “Star Wars,” a favorite movie of Vicky Keahey, founder of In-Sync. But the name also has a deeper meaning. “Plus, he really does resemble Adam Driver as Kylo Ren in the ‘Star Wars’ movies,” Culver added. Though the sanctuary hoped Zahra would care for her baby, the relationship between mother and cub was strained almost from birth. 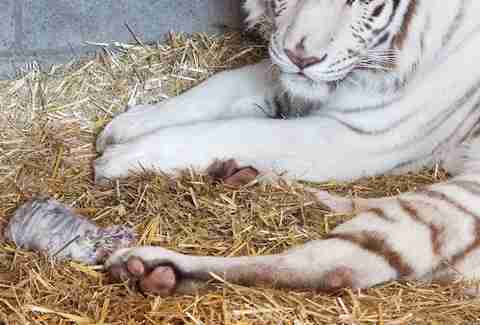 The reason Zahra rejected her cub remains unknown, but it’s not abnormal for first-time tiger moms to be unsure of what to do — especially if they’ve been raised in captivity with nobody to show them the ropes. 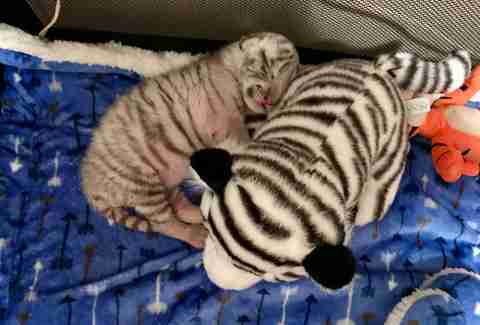 After six hours of observation, workers removed Kylo from Zahra’s enclosure before his body temperature could dip too low, giving the tiny 1-pound cub a better chance of survival. 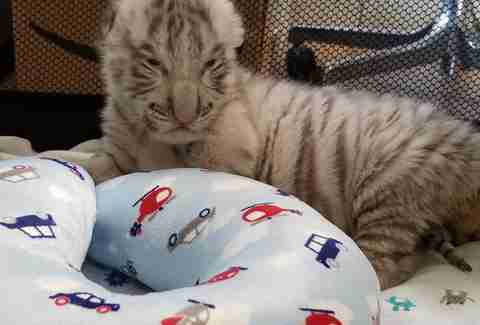 Now 2 weeks old, Kylo has opened his eyes and is enjoying stumbling around his soft surroundings, snuggling plush pillows and stuffed animals. 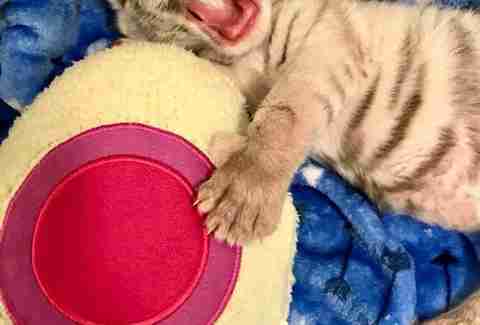 He has even experimented with his “roar” when he’s ready to be fed. But Kylo may not be out of the woods just yet. 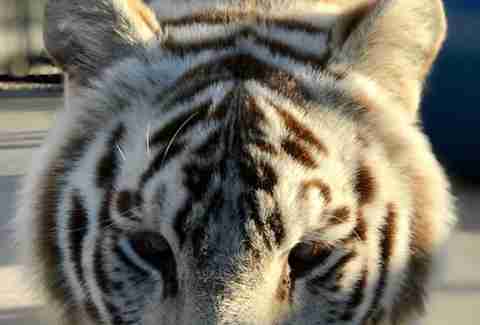 Due to the generations of inbreeding that produce their unusual coats, white tigers are prone to serious health issues. 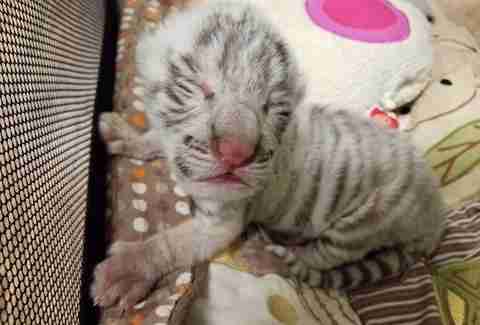 Many white tigers suffer from genetic deformities such as cleft palates, crossed eyes, clubbed feet and organ deformities, Culver noted. 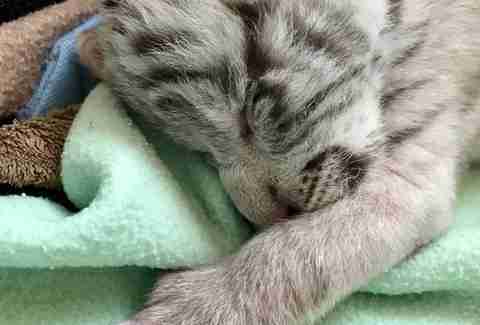 As Kylo’s parents are siblings, his health is being monitored closely should any issues arise. While Kylo will never be able to meet his parents, he will soon see the sunshine and feel grass for the very first time. Once he reaches the age of 3 months old, he’ll receive vaccinations, and get his own spacious outdoor enclosure, where he can lie in the warm sun, swim in pools and play with enriching toys. Little Kylo has a lot to look forward to. If you'd like to help Kylo Ren and other rescued cats, you can make a donation to In-Sync Exotics here.